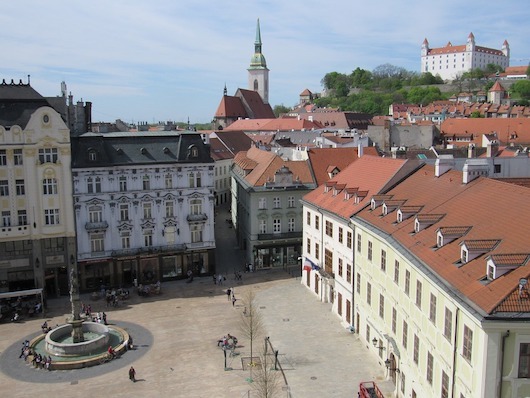 This is a ‘runseeing’ tour of some of the historic highlights of Bratislava. The historic center is on the left bank of the river, bordered by the Castle to the west, Šancová/Rt. 572 to the north, and Karadžičova to the east. The streets of the old city are winding and narrow, so it’s quite difficult to map a specific route for you without many twists and turns. 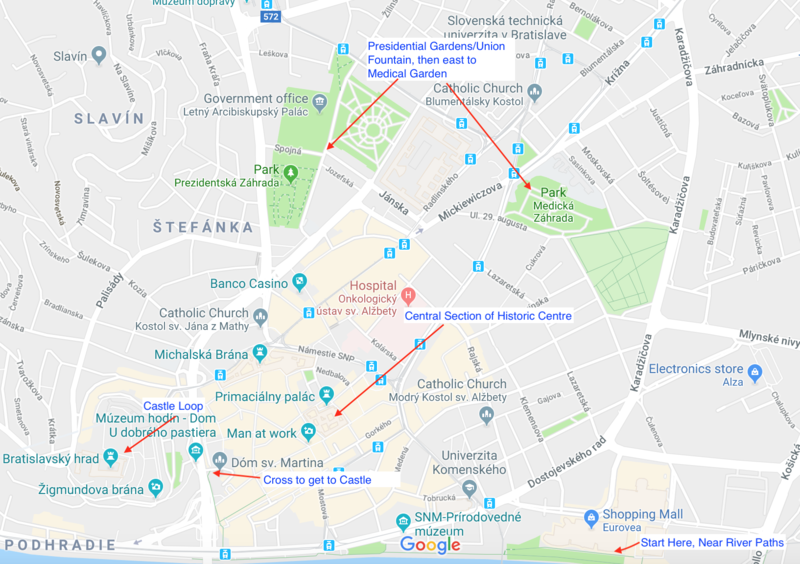 Instead, see our description of an outline route below, our route map, and then a ‘history run’ map produced by visitbratislava that lists the main sites of the old city. 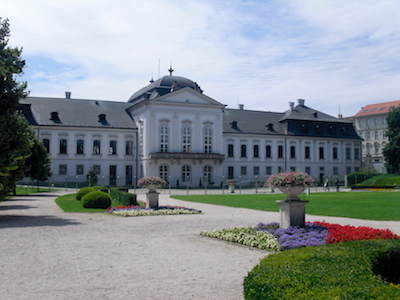 The main elements you want to cover in a ‘runseeing’ tour of Bratislava are a stretch along the river’s left bank, a loop around the Castle, the Presidential Garden/ Fountain of Union complex over to the ‘Medical Garden’, and a DIY tour of the maze-like streets of the historic center. Recommended Outline route: START at the Socha Milana Rastislava Štefánika landmark, head west to the Slovak National Museum, and continue along the water, crossing the street at the Old Bridge, and do a loop around the Castle. Head north for 0.5 km for a loop around the spectacular paths of the Presidential Garden, grounds of the government offices, and the Fountain of Union. Then head back slightly south to create your own tour of the maze-like streets of the old city, capturing some of the major sites. Michalská is a good north-south anchor toward the river, and Panská is a good east-west anchor. Official start is Socha Milana Rastislava Štefánika; Or anywhere convenient.